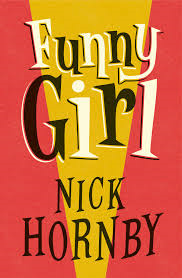 “Funny Girl – the much-anticipated new novel by Nick Hornby, the million-copy bestselling author of About a Boy Make them laugh, and they’re yours forever…It’s the swinging 60s and the nation is mesmerized by unlikely comedy star Sophie Straw, the former Blackpool beauty queen who just wants to make people laugh, like her heroine Lucille Ball. Behind the scenes, the cast and crew are having the time of their lives. But when the script begins to get a bit too close to home, and life starts imitating art, they all face a choice. The writers, Tony and Bill, comedy obsessives, each harbour a secret. The Oxbridge-educated director, Dennis, loves his job but hates his marriage. The male star Clive, feels he’s destined for better things. And Sophie Straw, who’s changed her name and abandoned her old life, must decide whether to keep going, or change the channel. Nick Hornby’s new novel is about popular culture, youth and old age, fame, class and teamwork. It offers a wonderfully captivating portrait of youthful exuberance and creativity, and of a period when both were suddenly allowed to flourish. Fans of Hornby will love this book, as will readers of David Nicholls, Mark Haddon and William Boyd” – BooktopiaBeing a Nick Hornby, I already had my imagined soundtrack picked out to accompany this book. After all, this is the creator of “High Fidelity’ and ‘Fever Pitch’ and ‘About A Boy’. Why wouldn’t there be some music humming away behind each character and each scene? And I had the singles loaded up, with a stack of pennies ready to go. Martha and the Vandellas, Duffy, Lulu, the them tunes to ‘Bewitched’ and ‘The Jetsons’, The Beatles (Mod Period), Gerry and the Pacemakers and even ‘Housewife’s Choice’ (from the popular BBC radio hour). My selection was spot on. ‘Funny Girl’ sets itself in post War-60’s England, and opens at a Maplins style Blackpool and then moves to an emerging Austin Powers swinging London. Flower Power has not hit yet but The Beatles are packing for America, the Ed Sullivan Show, and Elvis will be returning to tour soon. But this book is not about music. It’s about Barbara. A knockout, smashing girl, with a large chest, long blonde hair and a full, peachy bottom, ready to be pinched. She’s just won a bathing beauty competition and has been told of the wonders of a full year’s programme as reigning queen – kissing babies, avoiding the gropes of the mayor and no doubt endless beauty parlour openings! Ahhhh! Trouble is, she wants not a bathing beauty. Barbara wants to be a Lucille Ball and models her self, a least internally on the maverick comedienne. She has a hard time believing herself, when she has the looks of Dian Dors and Marilyn Monroe. In fact she often gets mistaken for Sabrina, a stunning page 3 beauty who makes her crusts on her ample bosom and aerated mannerisms. Sabrina (aka Norma Sykes) actually existed in real life (Hornby includes a photo of her doing her best to distract our gaze from the product she’s trying to sell in the poster – a slide projector I think?). The book cracks along at the pace of a 60’s sitcom. Barbara meets her agent appropriately at the jewellery counter of Derry and Tom’s (where many young ladies can catch their future husbands). But he’s entirely distracted by her looks and doesn’t believe she’ll become a serious actor. He does his best to send her to auditions where she’ll fail in a ploy to wear down any dreams and hopes she’ll eventually yield to the dark side of glamour photography! But has other plans. In a chaotic scene she arrives at the read through of a new pilot on the new fangled goggle box. She also meets two, rather insecure, but talented writers – one gay and one who’s pretending, unsuccessfully not to be (after all he’s married and this is still a country where gay men can be locked up for their sexual choices). That fact alone seems to breeze over Barbara. She may be her own woman but she’s oblivious to the sexual revolution smouldering away underneath her feet. Tom and Bill are the archetypical Swan and Flanders types – or perhaps duplicate copies of Tony Hancock – the famous BBC comic of the 60’s and 70’s. You can imagine them squabbling away over various minor points, in their tight 60’s flannel suits, skinny ties and brylcream come overs. I loved their wonderful restrained campiness, offset by Barbara’s enthusiastic, ambitious drive. In one afternoon she turns their horrid little domestic half hour TV show into a whole 13 part series. And becomes the lead, to boot. She changes her name to Sophie Straw and a star is born. The book wants her to success, and without spoiling the story too much, she does. There are sojourns into romance and friendship, the value of work and the optimism of the new decade. The pace is, like I said before at the speed of a half hour episode-per chapter. And the contents of each I s just right, too. Not too taxing, with breaks commercials and tea-cup refills. The decade wears on, the British public fall head over kites in love with her, not realising that she’s become a strong female lead at a time when women were only just emerging back out of the post war shadows. I found the whole book just washed over me, e a comfortable, familiar re-run. The kind you get out from the library on a cold afternoon, by the box set. Hornby uses sweet images to illustrate point, but I still had to resort to Google occasionally to find out who he was referring to as his references were both familiar and obscure at the same time. I did love the way he avoided too many cliché’s. If this ever becomes a film, then I’d caution directors to choose the more obscure or realistic images of this period.Like I said at the start, the soundtrack was ever present. And so are the voices. Each character, especially Barbara/Sophie’s is strong and eligible. Her presence is also believable. It would be much easier to portray an uglier Sophie trying to find her self confidence. This is a revers: a Pretty, luscious Sophie has to battle sexism, bigotry and maintain her dignity. This is Hornby’s first book since Juliet, Naked, which was heavier than this one. Think of this as a switch in channel, not to the BBC light programme but still to a happy place like Jones or UKTV. Hornby’s books always conjure up a sweet cadence of music and relationships – not the crazy way out variety, but the familiar and the natural. This time Barbara/Sophie is quite a calculated person, with a voice that defies her outward appearance. She’s the thinking man’s crumpet and the literally dreamboat too. But this is still that light-hearted touch that Hornby has, perfect summer reader, I’d venture. This entry was posted in Book Reviews, Uncategorized by timgruar. Bookmark the permalink.